You can unassign fault stick(s) from one fault and assign them to another fault. 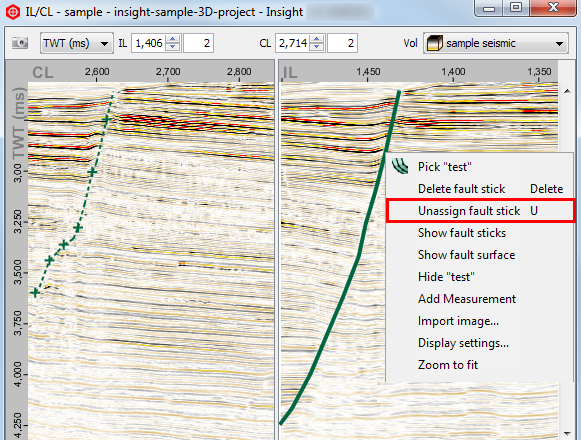 Similarly, if you have created fault sticks as "Unassigned Sticks (TWT/TVD)", you can assign multiple sticks to a fault at the same time. Right click on an assigned fault stick and select Unassign fault stick. Alternatively, you can press U to unassign a fault stick from its current fault. To select more than one fault stick, press Ctrl and click on multiple fault sticks. Right click and select Unassign 'X' fault sticks or press U to unassign. The unassigned fault sticks will be under the Unassigned Sticks (TWT/TVD) item in the Fault tab. In the Unassigned Sticks (TWT/TVD) item in the Fault tab, you will see the Number of Sticks that are unassigned in the Details Panel. Computed surfaces are not created for unassigned fault sticks. You can right-click the unassigned fault stick item in the Control Panel and click Export "Unassigned Fault Sticks" to save these fault sticks into a .dat extension file and then load the file in the future to view the fault lines in the data. Note: For unassigned fault sticks, you cannot change the ownership or edit the name. If you delete an "unassigned sticks (TWT/TVD)" item from the project database, it will get recreated when you open the session. Click the pencil icon at the fault that you want to assign the unassigned fault stick to enable the picking mode. Right click on an unassigned fault stick and select Move fault stick to "New Fault". Alternatively, you can press A to assign a fault stick. To select more than one fault stick, press Ctrl and click on multiple fault sticks. Right click and select Assign 'X' fault sticks to "New Fault" or press A to assign. Click the pencil icon at the fault that you want to assign the fault stick (Fault 1 in the example above) to enable the picking mode. Right click on the fault stick and select Move fault stick to "Fault 1". Alternatively, you can press A to re-assign the fault stick. 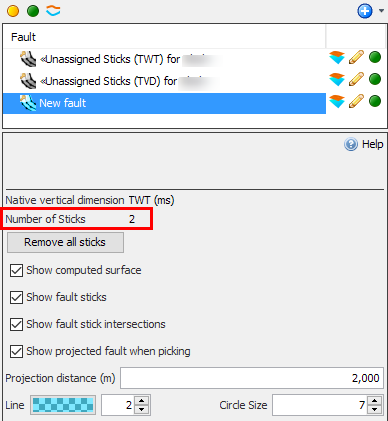 To select more than one fault stick, click the pencil icon of the fault containing the fault sticks (Fault 2 in the example above), press Ctrl and click on multiple fault sticks. Then, click the pencil icon at the fault that you want to assign the fault stick (Fault 1 in the example above), right click on the highlighted sticks and select Assign 'X' fault sticks to "Fault 1" or press A to assign.